The Wall crawlers new film is getting all manner of praise from the pundits, just out today in the UK, am trusting their opinions and upgrading my seating. There’s a handful of Spiderman based toys out there that are new ahead of this latest instalment and a stack load of licenced stuff that’s more generic Spidey that has been around a while. The Spider Bolt drone is specific to this outing, as he has a drone assistant in the film that helps him out. From the Sky Viper creators this model can reach speeds in excess of 20mph, fly up to ten minutes on a single charge, and generally stands out from other multi-bladed machines with its arachnid looks. 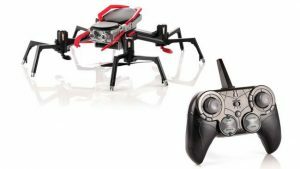 This foe-fighting sidekick will also be released as a pricier £150 unit with video feed so you can fly FPV with your mobile attached to the remote unit and BE Spiderman. Next Whats a Flamingo doing here?